My daughter and I have had suspected swine flu. After a week of feeling like Hell, we're getting better, but we're still very tired, snotty and coughing constantly. So Beauty Cult is taking a break over Christmas while we both recover fully. Have a happy Christmas, and I'll see you all in the New Year. Have you got any burning questions that you'd like to ask a beauty industry expert? Well here's your chance to get it answered! 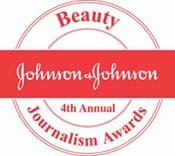 P&G, the company behind some of the biggest names in the industry including Max Factor, Olay, Clairol, Pantene, Sebastian and Sassoon, are hosting a live online event, where you can put questions to their team of beauty brand ambassadors. So there you go, easy peasy. You can register now to save you time on Tuesday, and I'd start thinking about your questions in advance. If you need a bit of inspiration, here's what I'm going to ask. To Desmond Murry of Wella Professionals Care & Style: "Can damaged hair ever be repaired, or does the damage have to grow out?" To Kathy Rogerson, of Olay: "Why did Olay change its name from Ulay?" (sorry, but product name changes bug me, I'd like to know how brands justify them). And finally I'll ask Dr James Russell: "Do you believe they'll ever be a home tooth whitening product that can match a professional dentist treatment?" So there is it, a simple way to get your questions answered by some of the big brand insiders. * This is a sponsored post for P&G via Handpicked Media. I've put my hair through a lot. Colouring, straightening, Yuko, IHR, daily blow-drying...so it's not surprising it's in poor condition. It’s true that some of these things I could avoid. But as a very dark brunette who's going very, very grey, colouring is a must, so I have to have my roots done at least every 6 weeks. To top it all, I have an incredibly sensitive scalp. Hair dye tends to sting when it's been on for more than 5mins, and for the next two - five days I'm generally very itchy and flaky. And when I say flaky I mean I probably lose an entire layer of skin on my scalp. It’s unpleasant, and it's a lot to go through to cover the grey. So you can see why I was intrigued to find out about Organic Colour Systems from Herb UK, a completely new way of colouring hair. This system contains really low levels of PPD, whic is the stuff that's in all permanent hair colours, to make it, well permanent. Organic Colour Systems contain 0.6%, but according to EU regulations, dyes can contain up to 6%. PPD is the ingredient most people who have reactions to hair dye are allergic to, and to make it even more tricky, it's one of those ingredients that can have a cumulative effect, one day you don't react, the next your head swells up. 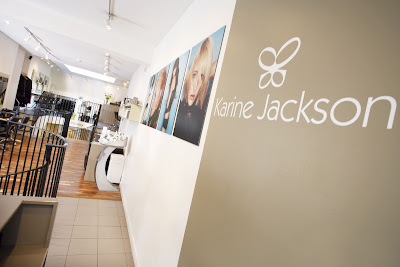 I was lucky enough to go to Karine Jackson's salon to try out Organic Colour Systems. I was sent a skin test beforehand just to be sure I wouldn't have a reaction to the colour, and in all my years of having my hair coloured, this is something that’s never happened before! My stylist, Arash, explained the processes to me. Unlike standard hair colours which are put on to dry hair, this system is put onto wet, just washed hair. After the wash my hair was wrapped in a hotel towel to open up the cuticles and prepare the hair for the colour. Once the colour is on you’re popped under the heat while it develops. Unlike normal dyes, it smells lovely, a sort of herby liquorice smell. I was on high alert for my scalp stinging, and although it prickled very slightly, it was nothing compared to what I've put up with in the past. I was really pleased with the colour, which matched my previous shade well – and yet managed to look a tad more natural. Even Mr Beauty Cult commented on how natural it looked, so it must be true! Now normally the itching begins the next day. So I waited, and waited. And there was nothing. Just as I was about to jump up and down the joy, three days later the flaking began. When I brushed my hair mid way through the day I could see large flakes, and this carried on for about 36 hours or so and is now (five days later) just a small amount of small flakes. This might sound bad to you, but to me it’s much better than my usual experience. There was no itching, no scratching, and no sore areas from itching too much. Plus, using the Organic Colour System means I’m doing less damage to my hair, and hopefully long term its condition will improve. The lovely Karine is determined to get to the bottom of the problems, so she’s invited me back again in 6 weeks when we’ll hopefully solve my itchy head issues once and for all. She’s also recommended I get a Mason and Pearson brush, and give my hair and scalp a good brush daily to really exfoliate it. I’ll report back again after that! I’ll also let you know how well the colour lasts – though at the moment it’s looking great. A colour with Arash costs £64, and a cut £33.50 if done with colour, or £43.50 on it’s own. The Karine Jackon salon is gorgeous, and I'd highly recommend Arash. It's taken my until the grand old age of 39 to get my skin under control. So I'm always wary of trying new skincare products. However, I was recently sent a pot of Perricone MD Cold Plasma cream, and feeling brave, I thought I'd give it a go. This is a face cream for all skin types, but it's main aim is to combat the signs of ageing. I quote "Cold Plasma addresses the 10 most visible signs of ageing: wrinkles, enlarged pores, dryness, discolouration, redness, uneven skin tone, impurities, loss of firmness, loss of smoothness and loss of radiance". Now that's quite a claim. My current skincare regime (which I'll go into in more detail in a future post) uses Karin Herzog Oxygen products, and they've not only combatted the problems I've had with spots, but they've helped keep the years at bay as well - and for my age, my lines are pretty minimal. But at my age you can't be too careful, so I was willing to introduce Cold Plasma cream to my routine. The first thing you notice about the product is the smell. As a young child I was force fed tablespoons of cod liver oil. And this is like smearing the stuff on your face. Basically, it bloody stinks. Now apparantly this is due to the fish oils it contains - so the smell makes sense. And really I'm happy they haven't covered the smell with fragrance which could cause a reaction. Due to it's stinky nature I chose to just use this cream at night (the instructions say morning and night). It says you can apply a moisturiser over the top, and on occasions I've used my usual night cream afterwards, especially during the old weather. Straight away I feel a difference - the next morning my skin was softer and incredibly smooth - not only could I feel this but I noticed the difference as I applied my make-up. I've been using it for 10 days now, and I'm going to keep going until I've used it all, so I'll report back on any further differences, but so far I'm impressed. I don't think I could cope with the smell day and night, and to be honest, I don't feel a twice a day application is needed. I'm pleased with the results, but there's a downside. Mr Beauty Cult says it stinks, and he's right to say so. So it doesn't do your love life any favours. But then isn't there always a price to pay for beautiful skin? And talking of price, this is not cheap stuff. In fact even in the luxury skincare market it's up there in the higher price bracket at £120 for 30ml. If you do want to take the plunge, you can order it online, but I'd have a go at getting a sample first. Regular readers will know all about the trouble I have with my dry hair. If you don't, read these posts and you be up-to-date. After reading my rather sad review of Philip Kingsley's Elasticizer, the lovely PR people sent me some more from the range to try and prove me wrong :) So this week I've been testing the Re-Moistuizing range, as well as Elasticizer Extreme. I've always stayed away from moisturising shampoo, as it never makes my hair feel really clean. There's only one thing worse than dry hair, and that's oily roots and dry rest-of-hair. So I tend to use a balancing shampoo and then a rich moisturiser. But I've used both the shampoo and conditioner in this range and I was pretty impressed. Lovely fresh smell, and my hair is definitely softer after using them. However after a few days (I wash my hair every day) I did find my roots were slightly greasy, so I suspect that the Moisture Balancing shampoo may be better suited to my hair. However, I'm still not convinced by Elasticizer (Extreme in this case). I know, I know, it's a cult product, but I'm just not seeing the results I'd expect with it. I've used it in the shower, I've used it as a special treatment and wrapped my head in the shower cap for 20mins, and although softer, my hair is no better than after 5 mins with either the Macadamia Deep Repair Masque or Moroccan Intense Hydrating Mask. So I'll stick with those until I find a true miracle product. If you've got dry hair and never get greasy roots, I'd recommend the Philip Kingsley Re-Moistuizing range, you can find them online here. Regular readers will know all about my mission to repair my very damaged hair. 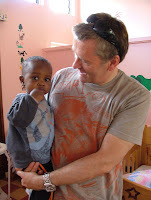 If you've missed out on my whinges about it, read this post, as this is another instalment. This week I've been trying the Moroccan Oil range. I'm a big fan of the Macadamia range, and I imagined this would be similar, but there are some differences, so I thought it would be worth comparing the two. I use Macadamia Deep Repair Masque as a daily conditioner, yes that's how dry my hair is, and so far on this quest, it's the best product I've tried. It smells lovely, is very thick and rich and leaves my hair feeling in the best condition it's been in in years. But I HAVE to use it every day. Macadamia Healing Oil Treatment is a great product. You apply it to wet hair and then dry as usual. It smells lovely, feels great and really helps smooth and soften my hair. The Moroccan Hair Oil comes in a really cool medicinal looking bottle, and smells utterly divine. Seriously, I could sniff this stuff all day. The Intense Hydrating Mask doesn't smell as yummy as the oil, it has a more artificial fragrance, and it's not as thick as the Macadamia. I used it in the shower, leaving on for around 7 mins. To be honest I know I'll get a better result if I leave it on longer, and although I try to do a deep conditioning treatment once a week, I need a product that's going to help on a day-to-day basis, as I'm a busy girl. I then use the oil on wet hair, and dry it in. Both products (the Macadamia and the Moroccan oil) claim to reduce drying time, and I really think they do. Both have a similar effect on my hair, it's much, much softer than usual but the Moroccan leaves it a little fluffy, with the Macademia it tends to be more well behaved. 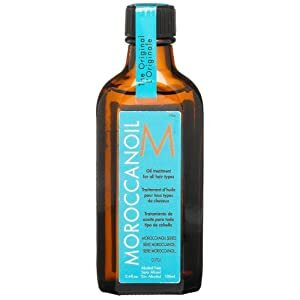 I get a good result with both of these ranges, and I'd recommend them to anyone who needs to put some moisture back into their hair, but I do think that Macademia has the edge over Moroccan. However, while they're working in the short term, my worry is that the condition of my hair isn't vastly improving overall - and that's something I really need to fix. So my quest continues, further updates soon! For as long as I've been writing about beauty products, Paula's Begoun's book Don't Go To The Beauty Counter Without Me has been sitting on my desk. It's a bible for the beauty industry, containing no-nonsense reviews of thousands of cosmetic and skincare products. Paula cuts to the chase, summing up the strengths and weaknesses of each brand and then going into product by product detail. She is the goddess of beauty product reviews. It's an American book (mine is, there may be a UK version) but most of the products are also available in the UK, and she covers British brands like Boots and Rimmel London. However, what I didn't know if that Paula's own range of products is available in the UK. 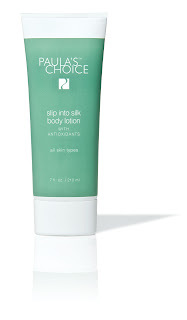 After a chat on Twitter (she's @PaulasChoice), I'm now using Paula's Choice Slip Into Silk Body Lotion every day. I'm not a big fan of body creams, I hate how many of them either have a strong perfume or a medicinal smell, and I can't bear the sticky feeling they leave behind. I'm also lazy, and as body creams are for bits of my body that are usually covered up, I just can't be bothered. 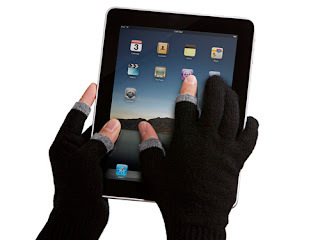 But boy does my body need them, especially now the weather has got so chilly. This cream doesn’t contain any fragrance, but it's natural ingredients give it a very subtle smell which is really lovely. What I love most about it is that one minute after applying it and it's totally vanished. There's not a hint of residue or stickiness, but my skin feels healthy and soft. It also contains antioxidants, so I can feel smug that I'm doing my skin long term good, not just smoothing over the cracks. The Paula's Choice range contains a huge variety of products, I've also got the Lip Exfoliant and Lip Recovery Balm, which I'll test soon. This is no exaggeration. Years of abuse has left my hair damaged beyond belief. You'd think I'd know better wouldn't you? But no, I'm a fool. A fool with broken hair. So let's assess the damage. I have very dark hair, the darkest brown without being black. And I started to go grey at around 26, so now, at 39, I really can't go more than 5 weeks without having my roots re-coloured. These days I always go to a salon, but once upon a time I also coloured it myself. So that doesn't help. Using straightening irons for 20 years. Yuko straightening system, twice. Once was great, once was ok (as in hair was straight) but it did dry the ends out. IHR straightening, twice. Once was truly great. The second, a few years later was terrible. I'm still suffering the consequences, literally broken hair, frizzy dried out areas, just awful. Brazilian Keratin permanent blow dry, twice. Once left me with a scaly, itchy scalp, but my hair was great. The second time it was kept away from scalp (but itchy, flaky problem still happened) and really dried out the ends. And as of last night I'm adding Origins Organics Hair Treatment Oil as an overnight treatment, which I'm currently pleased with. But for me the real test is whether it stays soft during the day, or just gets drier and drier as the day progresses. So I'll update you on this one. I also get a trim every five weeks. But really this is just maintenance, things aren't getting worse, but they're sure not getting any better. So if anyone out there knows how to save my hair please let me know, I'll really try anything. PS I've Just found out that Origins Organic Hair Oil is now only available via the Boots website, not from Origins stores or counters. Shame, I'm liking it so far. I always feel terribly let down when a cult product doesn't live up to the hype, and Philip Kingsley Elasticizer has been a big let down. I've ranted about my hair before. It's dry, brittle, over processed, and pretty sad. I'd been meaning to give Elasticizer a go for ages, so when some arrived on my desk I was keen to try it. Rather than apply like a normal conditioner, you use Elasticizer before you shampoo. You can apply in the shower and leave it on for a few minutes or leave it for 25-30mins covered with a shower cap (which is supplied). Now admittedly I haven't tried the shower cap part, and maybe I should, but I did leave it on for at least 7mins and I really can't see much difference. The results from using my trusty Macadamia Deep Repair Mask are much better. Maybe I'm just impatient, but I expected a better result. I should try the full shower cap on for 30mins routine, but it's hard enough to schedule a 30mins hair treatment in without being really sure it's going to give me a glossy mane! Which cult beauty products have you found disappointing? As winter comes we all need to take a look at our skincare regime and make sure we're ready to survive the cold. For me, lips and hands suffer the most, so I was just a tad excited when Creme De La Mer's newly re-packaged lip balm arrived on my desk. The skin on our lips turns over more than 4 times the speed of facial skin, so it needs extra protection, and many lip balms just aren't up to the job. My daughter is a little obsessed with lip balms, but recently I've realised that all the flavoured, tinted, sweet smelling balms she was using we actually drying out her lips. So we've chucked them all out and moved over to Carmex, a great product, but it's not glamorous. The first thing to note about Creme De La Mer's lipbalm is the packaging. It's a gorgeous little pot with a silver lid. It also smells divine. It's a strange mix of vanilla and mint, sounds weird? smells fav. It's also makes your lips tingle slightly. You can use it daily, or as an overnight treatment (which I haven't tried yet). Personally I'll keep mine in my handbag, as not only does it make my lips feel moisturised and smooth, but I feel just a little bit pleased with myself when I get it out of my make-up bag. Of course there's a downside, it's £36 for 9g. But it's definitely worth putting on your Christmas list, or buying for your best friend. Until this little pot runs out, the Carmex is just for the kids. And if anyone has a glamorous alternative to Body Shop Hemp hand cream for my dry hands, please let me know! I've been a strictly grey/black/brown eye products kind girl for like, well forever. But recently I've been experimenting with green. 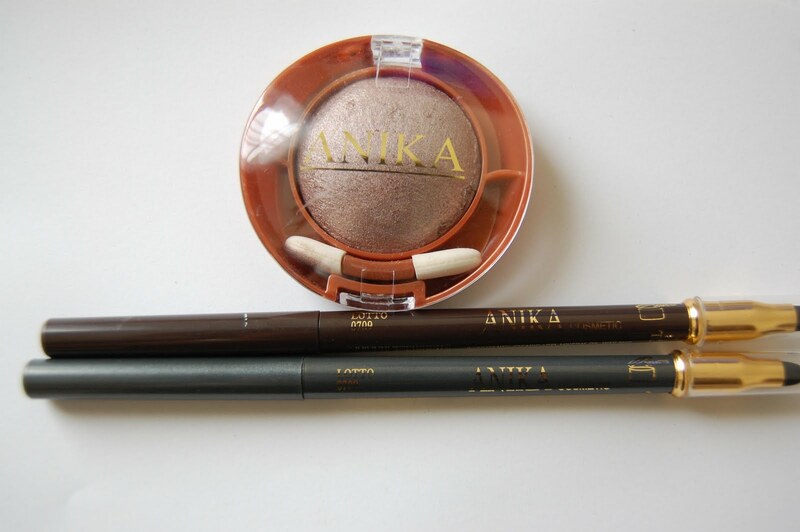 My eyes are very, very dark brown - almost black, and I'm finding the greens can give them a little more sparkle. And of course, my favourite Stila Convertible Eye Colour. 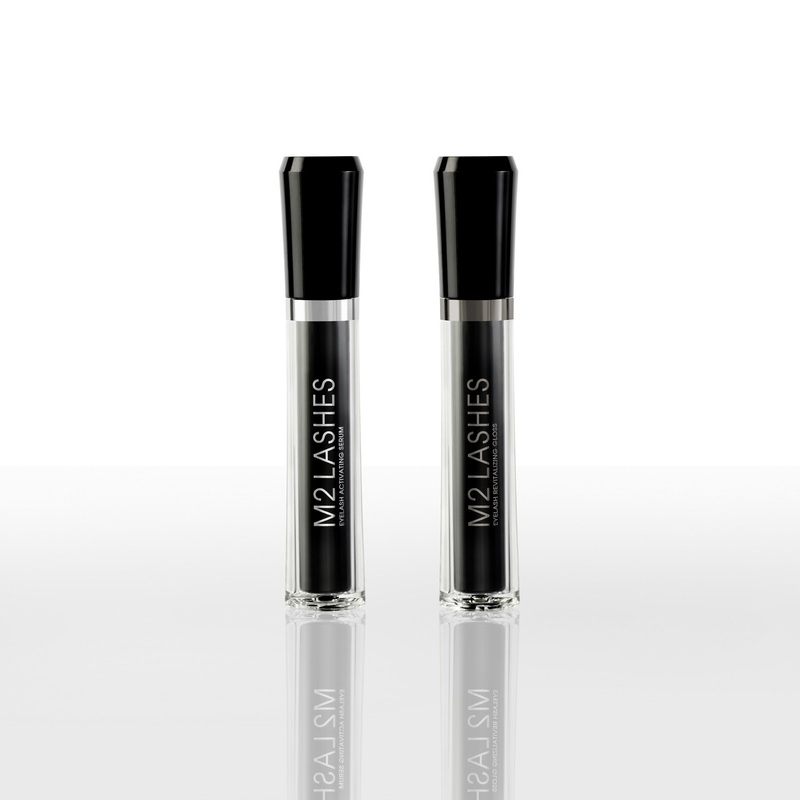 So what's your opinion of green eye products? I've spent most of my life searching for the ultimate spot zapper. And now, at the grand old age of 39, I think I've found it. It was a random purchase. I forgot my cleanser on a weekend away (dur) and popped into Space NK to get some Eve Lom as a stop gap. Like most of us I get break outs at the worst possible time, and I could already feel that I was likely to wake up with a huge spot the next day. 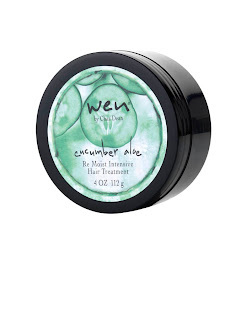 So when I noticed there was now an Eve Lom spot product, I thought it was worth a punt. The ingredients aren't particularly revolutionary, they include tea tree oil, salicylic acid and zinc oxide plus herby things like yarrow extract, fennel, camomile and balm mint. You apply it and then let it dry, and it leaves a white/pink crusty layer on your skin (a bit like calomine lotion). Not pretty. The instructions claim you can brush this layer gently off and apply make-up over the top, but I've found this a little messy. However as an overnight spot treatment it's totally amazing. Apply and leave to dry, then if you get chance apply a second layer. Seriously, spots are gone, or at least majorly reduced, by the next morning. I used to use Mario Badescu's Drying Lotion, which shrinks spots but leaves dry patches on my skin. But this Eve Lom product is so, so much better. Pricey at £18.50, but well worth it for the results. For one week only (actually 6 days as I should have published this yesterday), you can grab yourself a limited edition Clarins Beauty Flash Balm with a glittering Swarovski cap! I'm not going to blather on about the wonders of Beauty Flash Balm, we all know everyone should have some in their cupboard for those days when you've got a hangover, had no sleep, got a cold etc. It perks up skin like nothing else, it's a beauty editors fav, an utter classic etc etc. Fact is, it works. So if you want a spangly, blingy version, head over the Clarins online asap! Oh I do love a nice candle. Mr Beauty Cult would have a melt down (ha, get it?) if he ever discovered how much money I can spend on candles. I try and limit myself to rummaging in TK Maxx for most of them (you can find some beauties if you check every week) but I can't help the occasional splurge, my absolute favourite being Diptyque (in Baie, if I have a preference). 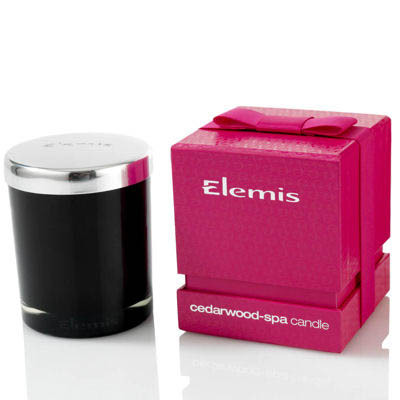 So I was very excited when the lovely people at Elemis sent me their Cedarwood Spa Candle to try. It's beautifully packaging in a pink box with bow. The candle comes in a black glass jar with a silver lid, very classy. The scent is a mixture of cedarwood, eucalyptus and rosemary, refreshing, yet relaxing at the same time - and most importantly not overpowering. Plus all Elemis candles are made with 100% natural oils. I think at £25 this candle is a bit of a bargain. Yes I know £25 isn't cheap, but cheap candles generally smell cheap, so they're money wasted. And I've been known to blow £36 on a Diptique. It's perfect for sprucing up the living room for autumn, or as a fab birthday present for a girlfriend. If you fancy one, you can order Elemis candles online. I struggle to feel truly healthy. I do some of the right things, I eat healthily, I don't smoke (anymore). But I do some things really badly. I exercise once a week at most, I buy supplements and forget to take them, I drink too much wine. So I'm always on the look out for ways to cheat, to be healthy without putting in the effort. Health Drops are a liquid supplement, you just need one drop, and it can be mixed into a drink. I'm going to quote the press release here: "Just squeeze one drop into a bottle of water or your favourite beverage and the potent formulation of nutrients, vitamins and minerals will be quickly absorbed to support detoxification, increase antioxidant levels, and promote and support a healthy immune system." Hmm favourite beverage....do you think red wine would count? I've been sent Antiox, and a tiny 1ml serving of this stuff contains the same amount of antioxidants as 15 cups of green tea. And it's created from 'botanicals' - to you and I this is a mixture of teas, bilberry, pomegranate and other healthy bits & bobs. You can hardly taste it in water, perhaps a slight hint of green tea, but if you added to a bottle of water you really wouldn’t know it was there. The thing that I find slightly odd about these supplements is that they're sold in Harvey Nicks rather than a health food shop. 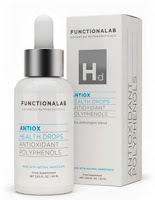 The press info says that "Functionalab joins the dots between nutrition, cosmetics and pharmaceuticals by approaching beauty from the perspective of health". Hmm what do you think about that? I'm sure being healthy does make us appear more beautiful, but I'm not sure about blurring the lines to this extent. Maybe women these days want to buy their supplements alongside their skin care, but to me it's still a little odd. However, a few days in and I'm committed to taking Antox every day. I'm successfully fighting off a cold which Mr Beauty Cult and our daughter have succumbed to. So maybe it's the antioxidants helping me, or maybe I'll come down with it tomorrow, or maybe I just don't get colds that often. The fact is, these days we all need to up the amount of antioxidants in our diet, I've had two people close to me diagnosed with cancer in the last year, so I'm ready to start taking this stuff seriously. Plus the retro looking little dropper bottle does look cool in the cupboard. Guthy-Renker was not a name that meant anything to me, but I’ve just been sent a batch of products which all originate from them, so I thought I’d look into who they are. It seems that they’re an online distribution company, you can order individual products or become a member for added discounts, free gifts etc, or you can order larger batches of products – skincare kits, three months worth of hair care etc, which you can either pay for in one hit, or by monthly payments. They run TV campaigns in the US, with slick infomercials, and I imagine they shift a lot of products doing so! Many of their brands are celebrity fronted, and the one I’m talking about today is WEN by Chaz Dean (an LA based celebrity hair dresser). I have troublesome hair. It's my fault, I've been mean to it. It's coloured every five weeks, and I've experimented with every form of straightening treatment out there. The end result is that it's super dry. I'm not just talking the usual sort of dry, I mean so dry that I have to use intensive treatment masques as daily conditioner. I also have a super sensitive scalp, and many products make it itch and flake. My currently routine is working pretty well. It goes like this, Kerastase Bain Divalent Balancing shampoo (simply the best shampoo I have ever used), followed by Macadamia Deep Repair Mask (left on as long as possible, twice a week if I have time I wrap it in cling film for 10mins), finishing with Macadamia Healing Oil Treatment (two pumps when wet, then one more once dry). Not only is this complicated, but it's very expensive! 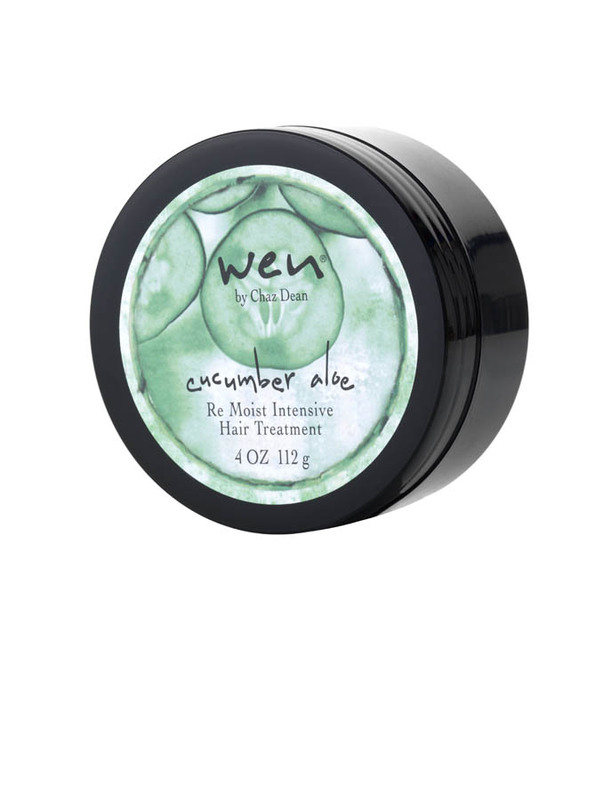 So when I was asked to try a WEN by Chaz Dean hair treatment, I was curious, but not overly confident it could cope with my dry frizzy main. I was sent the Cucumber Aloe Re Moist Intensive Hair Treatment, not the kind of flavours I associate with moisturing, but a lovely smell. I used it in the shower, so it was probably on my hair for 10mins. It's easy to apply, thick enough that it doesn't just escape through your fingers as you scoop it up (as I've found the Keratase deep conditioners do) and really does smell gorgeous. When towel dried my hair was easy to brush, but once brushed through I did still use my Macadamia Healing Oil Treatment. The result? I'm really impressed, my hair was soft and shiny, it still needed a little oil after drying, but then it is really damaged. Most impressive, it stayed moisturised through the day whereas often it gets dryer and dryer as the day goes on. It also smelt fab. I'd definitely use this again. Chaz Dean's real USP (sorry hate that expression!) is his cleansing conditioner, a whole new approach to hair washing that's detergent and sodium laurel sulphate free, it's said to form a cream on the hair which cleans and conditions at once. I'm curious about this, so may experiment with it in future. For more info on WEN, take a look at their website. I'll be looking at a few other lines from Guthy-Renker over the coming weeks. All prices approximate - shop around for the best prices. I've used up most of this pot now, and I'm not as convinced. Repeated use didn't seem to be improving the condition of my hair, and unless I use a lot (and I mean a lot), my hair is dry again by the evening. So my quest for the ultimate hair treatment continues....until I find something better I'm back on the Macadamia Deep Repair Mask each and every day. A recent study has show that drinking Willow Water, a mineral water from the Lake District, can reduce the appearance of wrinkles. Now, this is the sort of press release that really makes me sceptical! We all know that drinking water, and generally staying hydrated keeps skin looking more plumped up, and therefore naturally reduced the appearance of wrinkles. So where's the story? The trial took 54 men and women aged between 24 and 43, half of them were given 1.5 litres of Willow Water to drink per day, the other half drank 1.5 litres of a 'leading brand of mineral water'. Curiously, the results even shocked the medics involved in the trial. After eight weeks the doctors found an average 20% reduction in the appearance of wrinkles across the entire study, with women showing an average 24% reduction. However, and perhaps proving that none of us drink enough water, the placebo group also saw a reduction in their wrinkles - by 19%. So the women in the group's wrinkles were 5% more reduced that those who just drank standard mineral water. Apparantly this is due to the salicin and high levels of calcium in the water. Salicin is an anti-inflammatory agent that is produced from willow bark. It's closely related in chemical make-up to aspirin, and when consumed, it is metabolized to salicylic acid - the very same stuff that's put into many anti-ageing creams. While that's scientifically interesting - I'm not sure it's a significant enough amount to justify buying one particular type of water. But then again maybe if I was particularly troubled by wrinkles I'd give it a go, I hear on the grapevine that the girls from Coronation Street are all trying it. Willow Water is priced at around £1.80 for a 1.5 litre bottle, or you can get a discount buying in bulk from their website. And if it's not for you, at least make sure you drink a couple of litres of something every day - and alcohol, tea and coffee don't count! Could I look as good as Cindy Crawford? Today I was sent two products from Cindy Crawford's beauty line - Meaningful Beauty. Now personally, I'm suspicious of celeb branded products of any sort. I nearly died with irritation when the only oven dish that suited my needs was a Jamie Oliver one. If something's good, it should just be good, no need for the celeb branding. But maybe that's just me. I've spent some time on the Meaningful Beauty website, and watched a very cheesy video with clips of ladies with perfect skin describing how they now have perfect skin like the 'icon' Cindy Crawford. Don't watch it, it's enough to put you off the brand before you've tried it. But I'm going to try and put my cynicism aside. The range was developed with Dr John-Louis Sebagh, the famous cosmetic surgeon who is the brains behind the Dr Sebagh range. So there are serious credentials here, way beyond those of a model with fabulous skin. I was sent the Eye Creme (why not cream? is Cindy Crawford French? I don't think so) and Glowing Serum, and I do need a new eye cream and I definitely need some glow. Reading the ingredients list there's nothing worrying, so I'm not concerned I'll get a reaction. Plus the Glowing Serum contains Vitamin C, and I've just been reading about the benefits of stabilised vitamin C in beauty products - so I'm willing to give these a go. So who knows, maybe they will make me look as good as Cindy, I mean we've got a lot in common, both 40ish (she's actually older than me, ha! ), both married with kids, both....oh bugger that's where the similarities end. I'll give them a go and report back. Origins VitaZing with Mangosteen - could it be magic? 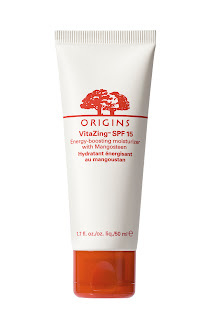 Already a cult product in the USA, Origins VitaZing has just hit the UK. And it's easy to see why our American friends love it so much. It's marketed as an energy boosting moisturiser, but it's so much more. It contains a mineral pigment, which is invisible at first, but releases a subtle sheer colour which adapts to your skintone, giving your skin a fresher - more awake appearance. Sounds impossible? Well I thought so, but then I tried it, and this baby really does what it says on the tube. It might sound like something concocted out of nasty chemicals, but even on my hyper sensitive skin Origins products have always been brilliant, and this one is no different. So I'd recommend for others with skin of a sensitive disposition. Use in place of your usual moisturiser, (it's SPF 15, which is a bonus)). Today I've only had a few hours sleep, so I experimented with dabbing it on on top of my make-up at lunch time to give my skin an extra boost. Probably not something the professionals would recommend, but at least it helped me brave the playground at school pick up. So could it be magic? well it's the closest thing to magic I've tried in a while - though I'm still not sure what a mangosteen is! VitaZing is available from Selfridges London during September, and nationwide from October 1st 2010 for £25. My desk is a tip. I'm not over egging it here, if it wasn't so messy I could find my camera battery recharge lead and take a photo of it for you. Amongst the chaos lurks various beauty products that for some reason or other never make it off my desk. This was a nail varnish I bought from Space NK in Bath on a romantic weekend away. My hubby decided this was the perfect weekend to buy himself a new guitar (his 7th), so I needed to shop. The nail varnish (Brown Button) was so-so, but the packaging is devine, never has more effort been put into packaging nail varnish. I love this stuff but laziness has stopped me moving it into the bathroom and actually using it. I'm happy with my skincare routine at the moment, and because I often work on auto pilot, I just can't seem to remember to incorporate this stuff. The only thing that really helps my hands during the winter when they get painfully dry. Has probably been lurking here since last winter. Must get more. No idea if this is any good as applying to hand isn't best test. I only suffer from dark shadows after a particularly heavy weekend and my social life has been nearly non-existent lately so haven't had reason to try. So what beauty products lurk on your desk? 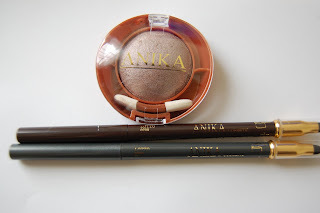 Anyone heard of Anika Cosmetics? Nope, nor had I until a few weeks ago! I'm lucky to spend a fair bit of time in Italy, and on a recent trip I came across a cosmetics shop I haven't seen before - Anika - in a shopping centre. We're talking cheap-as-chips cosmetics here, my haul of two eyeliners, one eyeshadow and one nail varnish came in at 8 euros. Cheap it may be, but in typical Italian style it was a gorgeous shop, with a gorgeous (if somewhat overly made-up) girl behind the counter. So what did I think? 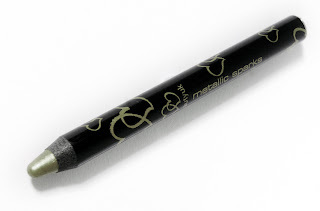 The eyeliners are pretty good - not as lovely as my beloved Stilla, but for a couple of euros a good buy, and they didn't irritate my sensitive eyes. Plus they have a smudger at one end, which I always like. 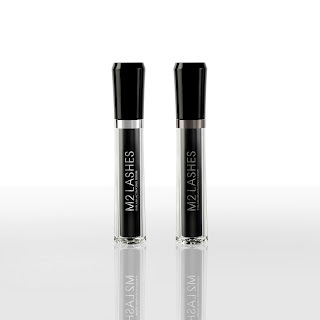 The eye shadow is a fab colour, a shiny grey with a pinkish hue, but it doens't last that well. The nail varnish is a fantastic colour, a sort of purpley pink (photo coming, camera battery just died) and after two coats has a lovely texture. Considering I never wear rubber gloves, wash my hands 300 times a day and do the gardening it survived for four days - good going in my book. If anyone has seen Anika for sale anywhere else let me know, otherwise I'll be back there next time I'm in Italy stocking up! PS For the detail lovers among you, the shopping centre in question was just outside Latiano, in Puglia, Southern Italy. Yipee for copycat nail colours! OK, for the purposes of any legal people, I'm 100% positive that this fabulous collection of nail colours is 'inspired' by Chanel's Khaki collection, and is in no way copied. But isn't it great that affordable brands are bringing out stylish colours almost as quickly as the high end brands? Personally, I love Chanel's colours, but I've never been impressed with the quality of the nail polishes finding that they chip easily and just don't last as well as other brands. So however cool the shade, I'm not going to rush out and spend a small fortune on a product I don't think lasts. So here's the latest offering from Models Own, the Car Key Collection (great pun eh). Are they gorgeous or what? I'm not going to show you on my nail because I'm pants at applying nail varnish. 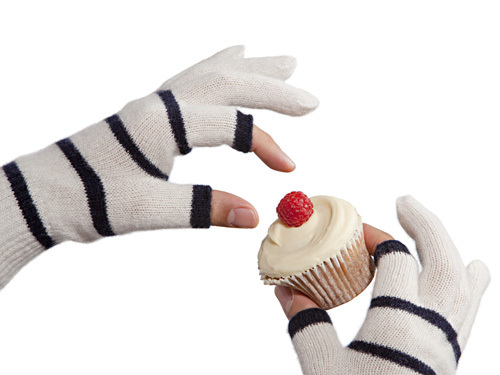 But these little lovelies are only £5 each, so go grab some and try them out yourselves. Beauty Cult is currently sporting Becca's Brown on both fingers and toes, and in a word, it rocks. I'm all for an easy ride when it comes to make-up. Getting me and my seven year-old daughter out of the house on time is always a challenge, and I will never, ever set foot in the school playground without make-up on, so anything that makes life easier is worth a try. 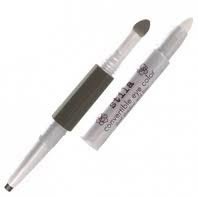 I've loved my Stila Convertible Eye Colour in Slate for a long time (in fact I'm on my second one), it's perfect for creating smokey eyes in a millisecond, but personally I find it too dark for daytime use. On a whim I bought (yes bought! it does happen sometimes) another in Ivy. It's a greyish green, not a colour I've ever tried before, as I've always thought green eyeshadow was made for middle aged women, but on my very dark (some might say freakishly dark) eyes the effect is great! For those of you who haven't played with one of these, it's an eyeshadow, eyeliner and smudger all-in-one, and it's foolproof. Ok crap title, but after 6 months or neglect, Beauty Cult is waking up again, so forgive me for the cheesy headline. Let me know what you want me to write about, having problems with your skin? can't find the perfect lipgloss? just want to tell me about an amazing new product? And if not I'll just let you know what's happening in the beauty world.